The Family of the Archbishop of Canterbury, Thomas Cranmer (1489-1556), and he himself, lived in Aslockton. 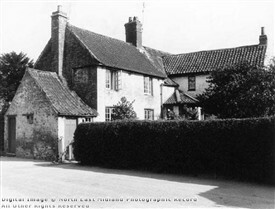 He was born there on the 2nd July 1489, the son of Thomas Cranmer Senior and his wife, Agnes (nee Hatfield). As a boy he was reported to have sat on Cranmer's Mound (a well preserved Motte in the village) and listened to the Whatton Bells. He left the village at 14 to attend Jesus College, Cambridge, and, in 1530, became Archdeacon of Taunton. The course which he advocated with regard to the divorce of Queen Catherine brought him into favour with King Henry VIII and, in 1533, he was appointed Archbishop of Canterbury. The servility with which Cranmer lent himself to the accomplishment of Henry's lawless desires, the timidity which made him acquiesce in deeds of tyranny and violence, from which his conscience revolted, remain as a blot on his memory. Yet, it was in great measure due to him that the English Church emerged from the fierce ordeal retaining, unimpaired, her ancient Faith and Apostolic succession. The Book of Common Prayer is the lasting memorial of the religious spirit of that time, and Cranmer is entitled to the fullest share of praise for the wisdom which guided its compilation. The Sarum Use, which had acquired a dominant position in the English Church in medieval times, was retained, with certain alterations, as the groundwork of the book, and this was enriched by contributions from very varied sources. The first Prayer Book appeared in 1549. Under the stress of foreign influences, it was subjected to certain alterations in 1552, but these were again considerably modified in the direction of the earlier book in 1559. When King Edward VI was dying, Cranmer was persuaded, much against his will, to sign the document by which the King designated Lady Jane Grey as his successor. 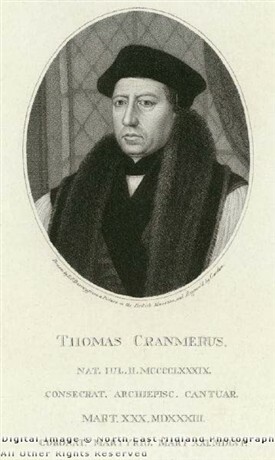 After the failure of the attempt to place her on the throne, Cranmer was charged with treason and sedition, and committed to the Tower of London. Thence, he was taken to Oxford and required to defend himself against the charge of heresy. Finally, sentence of death by burning was passed upon him. In the hope of saving his life, he recanted his opinions but, when called open to disavow them openly, he expressed deep regret for the cowardice which had led to his recantation and went courageously to his death at Oxford on the 21st March 1556, holding out the treacherous right hand that had signed the documents, so that it might be the first to be consumed by the fire.